The owners of Cheetah Paw Eco Lodge were brought to Africa by their passion…animals and nature. They immediately fell in love with the Africa wilderness. This magical land pulled them back again and again, until finally, they decided to build a small haven on this land. .
Having lived in Europe, Asia and the Americas, the owners understand how little people know about the African continent. They’ve seen the distorted picture that many people have about Africa. The owners wanted to provide a place to educate people about Africa, the African animals and nature. This tranquil lodge in the African bush is located in the center of the area’s activities and is a great place for people from all over the world to get close to Mother Nature. As soon as the owners purchased the land, the first thing they did was to take down the fences and let the dozens of animals that used to be “privately owned” go out and freely roam in the bigger Nature Reserve. They wanted the animals to live in their natural setting. A nice benefit is all the animals on the Nature Reserve are now free to visit Cheetah Paw. The owners make monthly contributions to the Nature Reserve’s conservation fund. The fund goes to taking care of the animals medical and other needs. They then turned a natural low land into a waterhole, where rain water can be preserved for the animals. Later they developed a natural creek into a second waterhole for water preservation. The waterholes are critical, especially in dry season, as they may be the only water source for the animals. The lodge facilities were built with consideration of minimal human impact and footprint, leaving the property as natural as possible. We want all our guests to enjoy the African nature as much as we do, and to go home with their love of Africa deepened and reinforced. 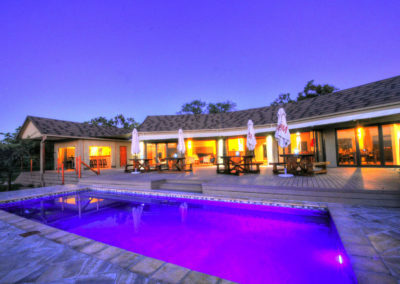 Cheetah Paw Eco Lodge is a 4-star standard tented lodge situated in the Guernsey Private Nature Reserve near Hoedspruit, gateway to the Kruger National Park. 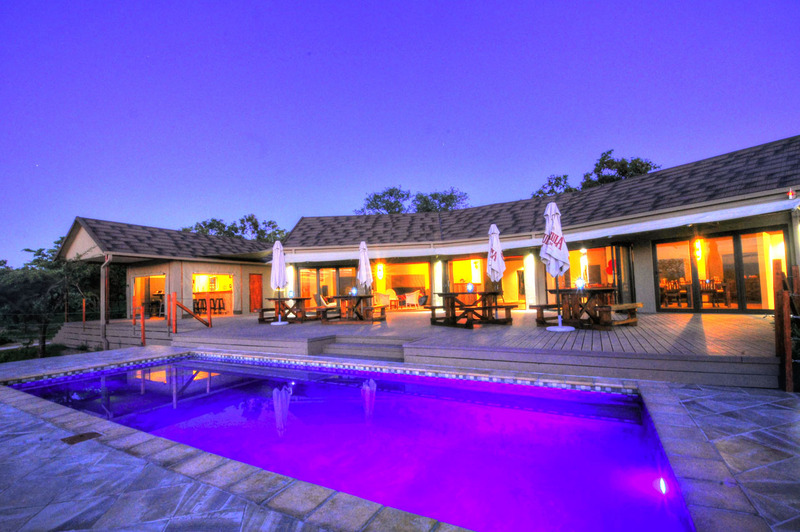 It is conveniently located less than 1 hour away from Kruger’s Orpen Gate. 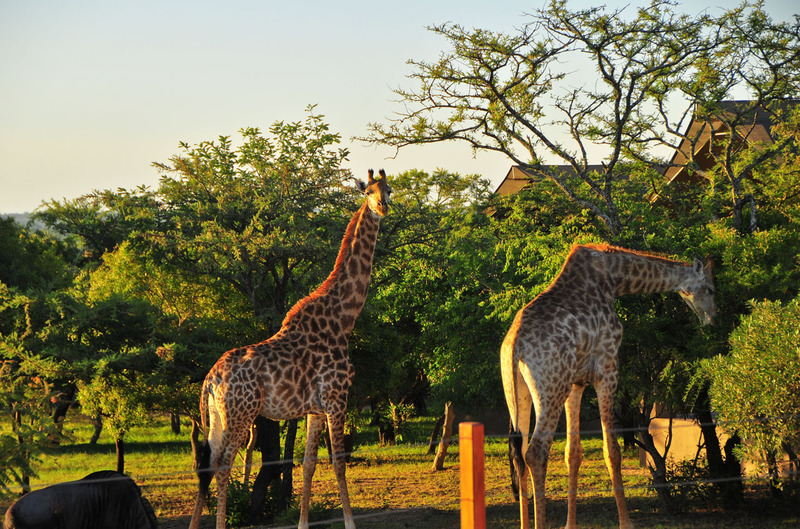 The Reserve is not in the “Big 5 Area” so guests are able to enjoy affordable room rates and can safely walk on the entire property, while watching zebras, giraffes, wildebeests, impalas, etc. roaming around the lodge. Each of the luxurious tented accommodations and the deluxe chalets has its own terrace for privacy and its own view of the waterhole which is frequented by animals. You stay in a luxury accommodation but feel close to nature with the African bush right outside your door. The tented main lodge has a spacious lounge with a TV for those who do not want to miss the news or their favorite sports. The viewing deck features a sparkling pool where you can swim or just chill out while you watch animals drinking at the waterhole. 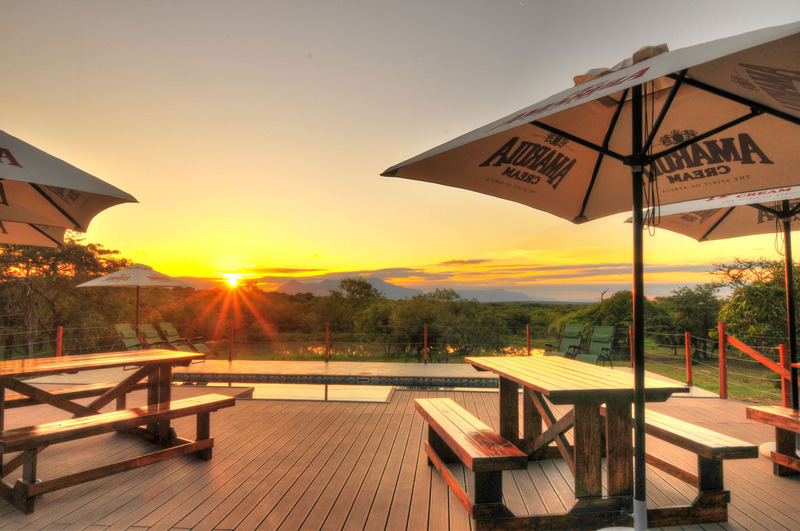 Our bar invites you to relax and watch the sunset with a refreshing sundowner after an exciting day safari or bush walk. The food at Cheetah Paw is homemade and prepared fresh daily with the best ingredients. A combination of the South African and International cuisine satisfies variety of tastes. The chef takes care of dietary issues and caters to individual needs on request. When weather permits, the set 3-course dinner will be served on the viewing deck, where guests can enjoy the delicious meal while listening to the sounds of Mother Africa. They might even hear a lion roar. 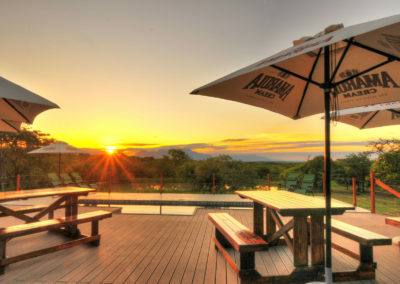 The guests can also enjoy a braai (African BBQ) dinner in our Boma, with a bonfire under the African sky full of stars. 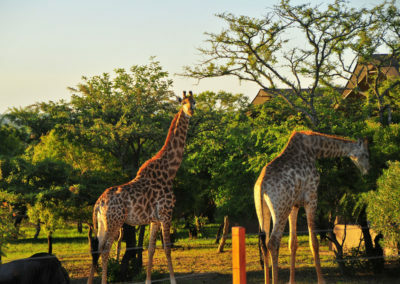 Various activities can be arranged for guests, including safari game drives, Kruger day tours, bush walks, panorama tours to the Blyde Canyon, hot air balloon, visits to endangered animal conservations centers, elephant back safaris, etc. Our friendly staff will make your stay with us at Cheetah Paw Eco Lodge a truly memorable African experience. Cheetah Paw Eco Lodge – Why do we GO GREEN? The team of Cheetah Paw Eco Lodge decided to GO GREEN and support the South African initiative to make people aware of the need to save their unique and precious environment. The government and local provincial municipalities started to teach the people to recycle their rubbish, separate glass, plastics, paper and organic waste. More and more locals understand and support this initiative. It is still a long way to go for the South Africans but the first steps in the right directions are done. 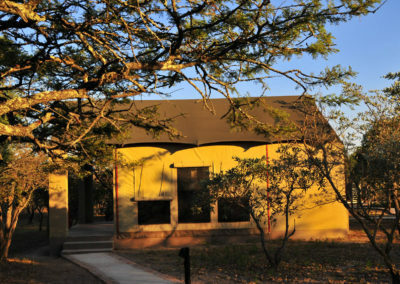 Located in an almost untouched area of the Guernsey Private Nature Reserve close to the town of Hoedspruit (Province of Limpopo) and the Orpen Gate of the Kruger National Park, the team of Cheetah Paw Eco Lodge decided to use the opportunity to build this brand new luxurious tented camp environmental friendly. Waste recycling, environmental friendly building materials and equipment are only some examples of our efforts to GO GREEN. Our furniture is produced with local woods and our freshly prepared food with seasonal fruits and vegetables is supplied by local farmers. Our team is dedicated to nature conservancy and the surroundings of the main lodge and the luxurious tented accommodations are kept as natural as possible. Indigenous plants and trees grow all over the property and our animals find their way to our natural waterhole while peacefully grazing around the lodge in the bushes and on the natural greens. A big variety of birds and insects can be found around Cheetah Paw Eco Lodge and we not only take care of the big but also the small creatures. With guided walks on the Guernsey Private Nature Reserve our guests get inside knowledge about nature and animals and our beautiful bushveld. Cheetah Paw Eco Lodge – Safari in style, in an Eco-friendly environment.